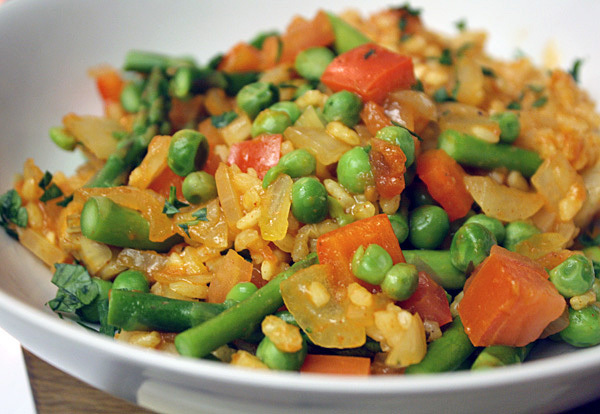 Chef Brian gave me the option of using bomba rice or jasmine rice for Week 3, Meal 3: Vegetarian paella, but I really wanted the bomba to keep this as authentic as possible. Lucky for me, Dave was willing to take me on a whim to La Espanola Meats in Harbor City to pick up the rice and nosh on some righteous paella. Theirs came with a charcuterie plate (with marinated olives I’m still dreaming about) and was packed with rabbit, chorizo, chicken and shrimp. It’s only served on Saturdays and if you’re anywhere close, you need to check it out. But for the finale to our vegetarian menu, we’re ditching the meat and piling on the veggies. Everything is fresh, yet I’d file it under “stick to your ribs” because it’s so filling. Follow the jump for the recipe and the how-to. There’s a lot of prep, but you’ll only need two pans to knock this one out. First, puree the tomatoes that need pureein’. 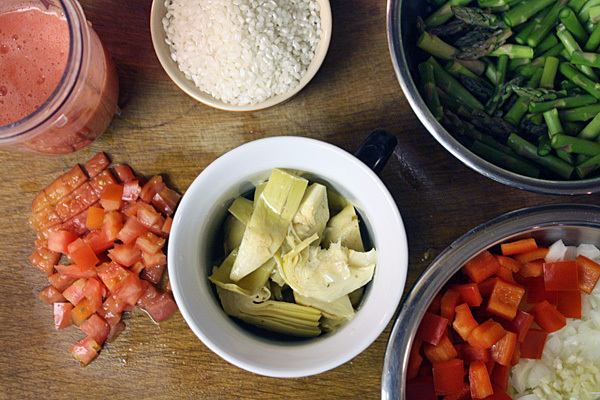 Knock out the mise: Prep the other tomato, asparagus, artichoke, peas, onion, red bell pepper, garlic, parsley and rice. If you lay out all of the ingredients first, everything from after moves quick. 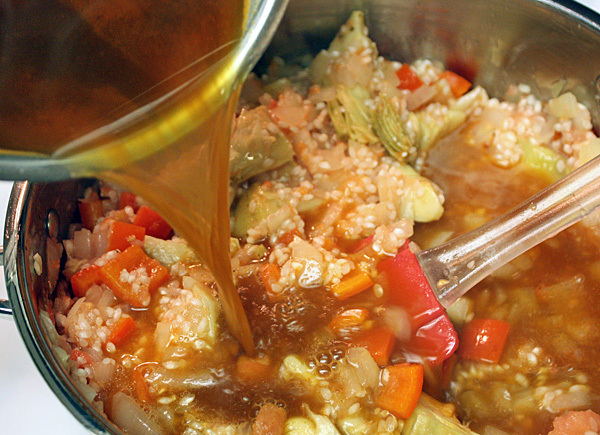 In a small pot, bring the vegetable stock to a boil and reduce to a simmer. 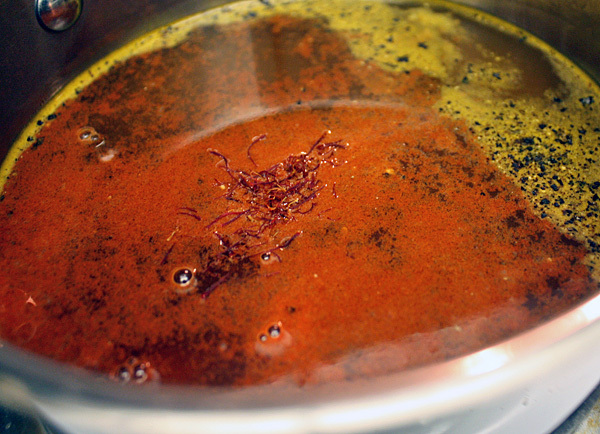 Add smoked paprika, saffron, salt and pepper. In a large shallow saute pan or sauce pan, heat the vegetable oil over medium-high heat. Add the onion, red bell pepper and garlic (sofrito) and saute for 2-3 minutes. Add the rice and saute for 1 minute, mixing it with all the veggies. 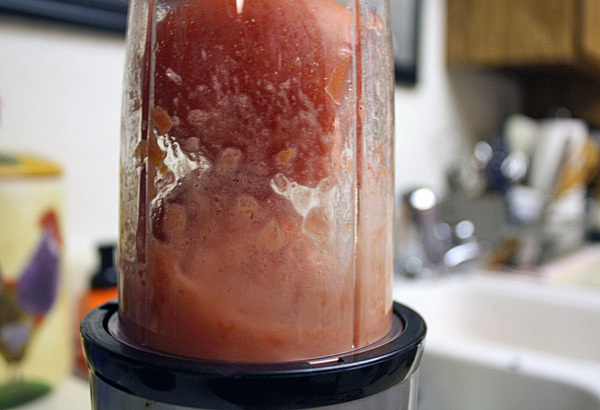 Toss in the artichoke hearts and pureed tomatoes and mix well. Add the stock and bring everything to a boil. Reduce the heat to medium-low and cook for 12-15 minutes. 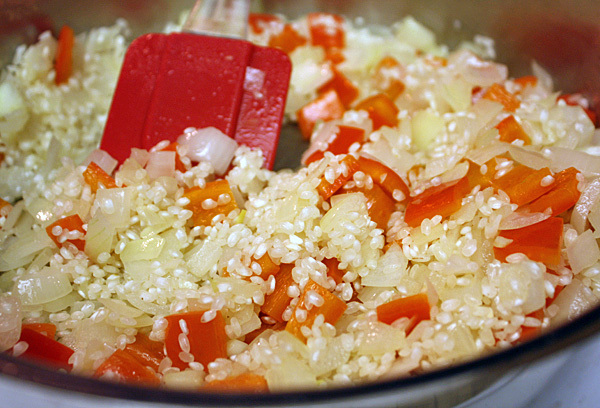 The rice should be nearly cooked and almost all of the liquid should be absorbed. Sprinkle the top of the rice with the diced tomato and asparagus and cover the pot. 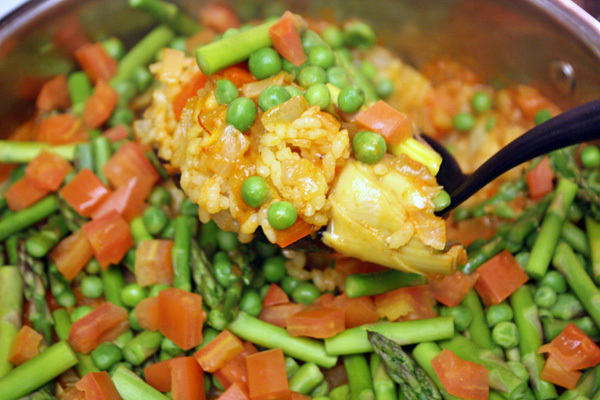 Continue to cook until the rice is fully cooked and the asparagus is tender, about another 5 minutes. To plate: Split the paella between two people and garnish with parsley. Heaviest weight (Aug. 2009): 267 lbs. Starting blog weight (Nov. 2010): 258 lbs. Lowest blog weight (May 31, 2013): 221.2 lbs. Current weight (March 9, 2014): 248 lbs. Niyaz Pirani is the owner of Knife & Spork Public Relations in the San Francisco Bay Area. Previously, he was an Orange County food writer for OC Weekly's Stick A Fork In It and the Orange County Register's Food Frenzy. He's become healthier since starting this blog, but is still working to get the weight off. He's has been dropping the gut by changing his lifestyle with exercise and cooking at home frequently instead of going out to eat every meal. Fat Dude goes to Wrestlemania! Darrel Thornley on 300+ miles.